In Sternschanze, in the old Schanzenhöfe (former meat central market), you will get the biggest variety of coffee in Hamburg. In elbgold, coffee is made a lifestyle and a passion. You can drink your coffee in the sun outside in the backyard. Or you can chill out inside the café. Beanbag chairs made of coffee bags invite you to stay and enjoy your coffee. 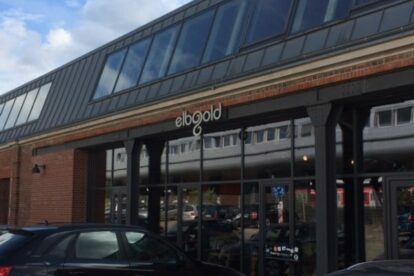 elbgold is not only selling coffee to drink at the place itself – it is also a roasting house where you can buy your coffee for home. Many of the coffees sold there are bought directly from local coffee plantations from all around the world. The elbgold café is loved by locals for the vast variety of coffee specialties! A second, slightly smaller café has opened to fulfill the coffee needs of Hamburg. The waiters and waitresses are happy to tell you all about the different types of coffee and preparation techniques. I personally drink my coffee with milk – so cappuccino is what I get at elbgold. The milk is always so well-frothed that I don’t have to add sugar to my cappuccino. I am a fan of mild coffee. But elbgold also offers very strong roasts for those who like their coffee black and intense. Not only is the coffee at elbgold delicious; they also sell freshly baked cakes, cookies and more.